DUMBARTON were left in a state of shock after visitors Ayr United scored two goals in injury time to level the match at 2-2. DUMBARTON were left in a state of shock after visitors Ayr United scored two goals in injury time to level the vital Ladbrokes Championship match at 2-2. It was a stunning end to a game which Sons dominated from start till the scheduled full time. However the point apiece moved both clubs further clear of bottom club St Mirren. Dumbarton had the lion's share of possession and attacking aggression in a feisty first half. Andy Stirling's fast runs tormented Ayr down the flank, but no-one could quite capitalise on his cutbacks. 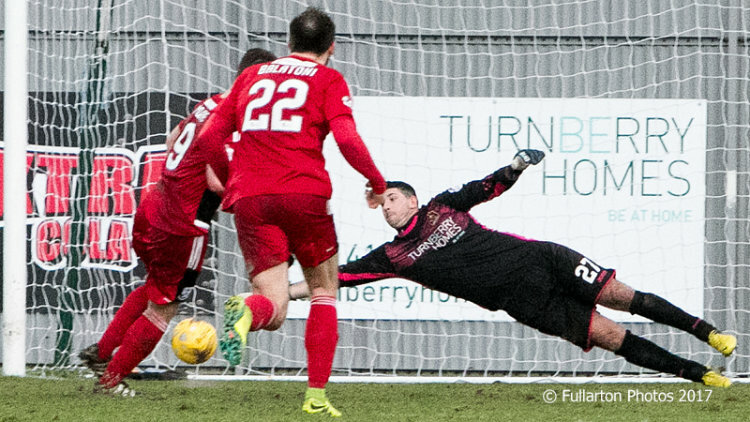 Then on 28 minutes Ross Docherty flew into a challenge on Stirling beside the touchline in the middle of the pitch. Referee John McKendrick rightly produced his red card and the visitors were down to ten men. From that point Sons slowed down slightly, and could not convert control of the ball into a material advantage. Dumbarton started the second half in the same determined spirit as they had played for the opening 45 minute. Then Ayr started to come back into it with several dangerous forays forward. On 62 minutes Dumbarton at last got their reward for hard work and dominance. It was a beauty of a shot from Sam Stanton, who drove forward before firing into the top corner of the net from 20 yards. The men from the Rock were relentless immediately after taking the lead, before the pace eased back again. Then Stanton grabbed his second, striking home through a crowded penalty box. But in a dramatic twist at the end Ayr scored twice in three minutes to claim an unlikely draw. First Michael Rose with a free kick on 91 minutes and then Craig Moore with a penalty — which keeper Alan Martin nearly saved (pictured) — on 93 broke Sons hearts.